Author contributions: Mimura T conceptulized and drafted this manuscript; Kawasaki T performed the surgeries; Mori K, Imai S and Matsusue Y equally analyzed this work. A wide variety of pelvic osteotomies have been developed for the treatment of developmental dysplasia of the hip (DDH). In the present paper, we present a detailed review of previous studies of triple osteotomy as an alternative treatment for DDH. We also report our experience treating 6 adult cases of DDH by triple osteotomy in order to highlight the various aspects of this procedure.The mean age of our patients was 31.2 years with a mean follow-up period of 6 years. We assessed range of motion, center-edge angle, acetabular index angle, Sharp angle, acetabulum head index, head lateralization index, Japanese Orthopedic Association score, Harris hip score, patient satisfaction, and the difference between lower limb lengths before and after the procedure. At final follow-up, clinical scores were significantly improved and radiographic parameters also showed good correction of acetabulum. Core tip: Various pelvic osteotomies have been developed for treating developmental dysplasia of the hip (DDH). In the present paper, we review previous studies on triple osteotomy as an alternative treatment for DDH and also report our experience with 6 DDH cases treated by triple osteotomy in order to highlight the various aspects of this procedure. In our cases, clinical scores as well as radiographic parameters were significantly improved. We found that the clinical results of triple osteotomy were satisfactory and it should be considered as an alternative pelvic osteotomy procedure in adults with DDH. Developmental dysplasia of the hip (DDH) is well known as a cause of secondary osteoarthritis of the hip. In Japan, approximately 80%-90% of hip osteoarthritis cases occur secondary to DDH. An acetabular osteotomyto treat DDH is a clinically important therapeutic modality especially in young adults with low-grade osteoarthritis, pre-osteoarthritis. Restoration of the anatomical and biomechanical relationship in cases of DDH may delay or prevent development of coxarthrosis. To date, a variety of acetabular osteotomies of the adult pelvis have been reported, including the Bernese periacetabular osteotomy, rotational acetabular osteotomy (RAO), and triple osteotomy procedure. The aims of these osteotomies have been to achieve acquire good containment of the femoral head and stability of the hip joint. A triple osteotomy is widely employed for treating DDH in adolescents and young adults, especially in those in whom the triradiate cartilage remains unfused[5-9]. The limited number of existing reviews of triple osteotomy prompted us to write an up-to-date review. In addition, few studies of triple osteotomy in older patients (age > 30 years) have been reported. In the present study, we also report a case series of triple osteotomyin relatively older patients (> 30 years of age). We performed 6 triple osteotomies in 4 adult patients with DDH, with bilateral osteotomies performed in 2 patients. The average age of the patients was 31.2 years (19-49 years) and all were female in the pre-osteoarthritis stage. The mean follow-up was 6 years. The center-edge (CE) angle, acetabular index angle, Sharp angle, acetabular head index (AHI), and head lateralization index (HLI), were evaluated on anteroposterior (AP) X-ray images (Figure 1). Range of motion (ROM), Japanese Orthopedic Association score (JOAS), Harris hip score (HHS), patient satisfaction (well satisfied, satisfied, and dissatisfied), and difference in lower limb lengths before and after the procedure were also assessed. JOAS consists of the items pain (0-40), ROM (0-20), walking ability (0-20), and activities of daily living (ADL; 0-20), with a total of 100 indicating the best hip function. Student’s t-test was used to determine significant differences between groups, with a P value of < 0.05 considered significant. 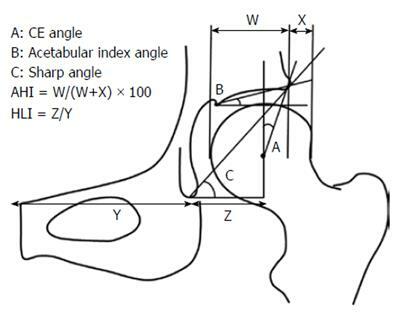 Figure 1 The center-edge angle, acetabular index angle, Sharp angle, acetabular head index, and head lateralization index were evaluated in anteroposterior X-ray images. CE: Center-edge; AHI: Acetabular head index; HLI: Head lateralization index. Arthroscopy was performed in all cases to evaluate the condition of cartilage and acetabular labrum, as well as the degree of osteoarthritis before the osteotomy procedure. All cases were in the pre-osteoarthritis stage and there were no acetabular labral tear. The triple osteotomy sites were nearly the same as those reported by Tönnis[14-16]. First, an ischial osteotomy was performed in a side-up position with 90° hip flexion. Next the position was changed to a supine position, and pubic and iliac osteotomies were performed through two independent skin incisions. The iliac osteotomy was performed using a Gigli saw, using a technique similar to that of Salter osteotomy. For the acetabular osteotomy, the acetabulum was initially rotated laterally. Then an iliac wedge graft was obtained and grafted between the acetabulum and the ilium. Three 3.0 mm K-wires were used for fixation of the acetabulum. Hip spicas were not required for postoperative immobilization. Pre-operative ROM was full in all patients. At the final follow up examination, mean flexion was 108.3° (100°-120°), abduction was 33.3° (30°-40°), external rotation was 58.3° (50°-60°), and internal rotation was 35° (20°-50°). Details follow-up findings are presented in Tables 1 and 2. With regard to acetabular coverage, HHS and JOAS were both improved. The average pre-operative CE angle, acetabular index angle, Sharp angle, AHI, and HLI value were 5.67, 21.7, 47.5, 58.4, and 0.63, respectively, with the corresponding postoperative values being 25.5, 6.33, 30.2, 78.4, and 0.65, respectively (Table 3). HLI showed no improvement, suggesting that medialization of the femoral head was not achieved, whereas HHS, JOAS, CE angle, acetabular index angle, Sharp angle, and AHI were all significantly improved (P < 0.05). JOAS was improved from 62.3 to 89.7 and HHS from 72.3 to 98.7. The average operative time was 5 h and 25 min, including arthroscopy and changing of position. All patients chose “well satisfied” for the satisfaction score. The average lower limb elongation was 12 mm. Two complications were encountered in 1 patient (case 6), temporary lateral femoral cutaneous nerve (LFCN) dysfunction and delayed union of the ischium. No patients had infection, non-union, other nerve injuries, vascular injury, or osteonecrosis of the acetabulum. Table 1 Pre-operative angle values and scores of all cases. CE angle: Center-edge angle; AHI: Acetabular head index; HLI: Head lateralization index; JOAS: Japanese Orthopedic Association score; HHS: Harris hip score. Table 2 Post-operative angle values and scores of all cases. Figure 2 Anteroposterior X-ray images of cases 1, 2 and 5. A: Pre-operative anteroposterior (AP) X-ray images of cases 1 and 2 showing pre-osteoarthritis in a patient with bilateral developmental dysplasia of the hip (DDH); B: Post-operative AP X-ray image at the final follow-up examination. Three 3.0 mm K-wires were used for fixation of the acetabulum. One of the K-wire was remained at the right hip; C: Pre-operative AP X-ray image showing pre-osteoarthritis in a patient with bilateral DDH; D: Post-operative AP X-ray image at the final follow-up examination. Table 3 The mean values of pre-operative and post-operative angles and scores. 1P < 0.05 based on a Student’s t-test. Patient at age at the time of surgery was 19 years old. The same patients underwent a triple osteotomy for the left hip (case 1), which was followed by a right hip osteotomy the next year (case 2; Figure 2A, B). The follow-up period for the right hip was 6 years. Pre-operative JOAS in the left hip was 63 (pain 20, ROM 20, walking ability 5, ADL 18), whereas that in the right was 73 (30, 20, 5, 18). At the final follow-up examination, post-operative JOAS in the left and right hips was 95 (35, 20, 20, 20) and 95 (35, 20, 20, 20), respectively. Pre-operative HHS was 70 in the left hip and 80 in the right, whereas both the corresponding post-operative values were 100. The operating time for the left and right sides was 5 h 21 min and 6 h 28 min, respectively, whereas bloodloss was 340 mL and 220 mL, respectively, and elongation of the lower limbs 15 mm and 20 mm, respectively. Patient satisfaction scores for both hips corresponded to “well satisfied”. Patient at age at the time of surgery was 43 years and the follow-up period was 3 years (Figure 2C, D). Triple osteotomy was performed on the left hip. Pre-operative JOAS was 80 (30, 20, 10, 20), whereas post-operative JOAS was 88 (30, 18, 20, 20). HHS values before and after surgery were 93 and 96, respectively. The operating time was 4 h 22 min, whereas blood loss was 830 mL, and elongation of the lower limbs was 8 mm. The values for the CE angle, acetabular index, Sharp angle, and AHI improved from 16, 14, 47, and 70.5 to 26, 2, 35, and 80, respectively. The first report of pelvic osteotomy as a treatment for DDH dates back to the classical report by Konig. Long after this original report, Blavier et al reported a circular osteotomy used to rotate the acetabulum over the femoral head. The concept of rotating the acetabulum over the femoral head developed into triple pelvic osteotomy first described by Le Coeur in 1965. Hopf further developed the ideas of pelvic osteotomy and reported double osteotomy and triple osteotomy in 1965 and 1966, respectively. Steel further modified the triple osteotomy procedure for the easier surgical access to the ischium. Since then, a wide variety of studies on pelvic osteotomies for adult DDH have been reported, including the Chiari osteotomy[22-24], RAO, Bernese periacetabular osteotomy, eccentric RAO, curved periacetabular osteotomy, and a modification of the Ganz osteotomy. The surgical sites of a triple osteotomy are the ilium, ischium, and pubis. The procedure provides improved coverage of the acetabulum along with biomechanical stability to the hip equivalent to that of an RAO. Steel’s triple osteotomy reported in 1973 has probably been the most popular and has undergone substantial modifications (Figure 3). Tönnis invented a major modification of Steel’s triple osteotomy, in which the site of the ischial osteotomy, closer to the acetabulum than in Steel’s osteotomy, is just adjacent to the hip joint, allowing an easier rotation of the acetabulum. The contact area is superior to that of the Steel’s osteotomy. Kotz’s polygonal triple osteotomy was described[28-32], in which the osteotomy lines of the innominate and ischial are polygonal, and the axis of rotation of the acetabulum is parallel to the superior pubic ramus. The rotated acetabulum is relatively stable and fixed with an internal fixation plate. Wall reported an endoscopic triple pelvic osteotomy in 2001, whereas Lehman described an “almost” percutaneous triple pelvic osteotomy in 2004. With those, a 2-incision surgical approach is employed and the iliac osteotomy is performed using a Gigli saw. They reported that their osteotomy method is safe and has a relatively shallow learning curve compared with other triple pelvic osteotomy procedures. Kumar et al also reported a modified triple osteotomy, which adds a shelf procedure to the triple osteotomy to achieve further stability of the hip joint and coverage of the femoral head. Figure 3 Several major modifications of triple osteotomy have been presented, and osteotomy line of the Bernese osteotomy and rotational acetabular osteotomy was also presented. In Steel’s triple osteotomy, the pubic ramus and ischium in front of the tuberosity are osteotomized. The site of the ischial and pubic osteotomy in the method of Tönnis is closer to the acetabulum compared with Steel’s osteotomy. In a Hopf triple osteotomy, the ischial tuberosity is osteotomized closer to the center of the hip joint than in Steel’s procedure. In a Le Coeur osteotomy, the pubis and ischial ramus are osteotomized closer to the pubic symphysis as compared with Steel’s procedure. A variety of devices have been invented to provide stability of the osteotomy site. Eren reported an “incomplete” triple pelvic osteotomy, in which a greenstick fracture was created in the remaining portion of the ischial body without a total iliac osteotomy. This highly stable osteotomy allowed early weight bearing. In turn, Lipton reported a different modification of the triple osteotomy, in which a wedge osteotomy was performed at the proximal part of the ilium. The resection of the wedge from the outer cortex created a slot, with the intact inner cortex serving as a stabilizing buttress where the distal posterior aspect of the ilium fits. This osteotomy allows for extensive coverage of the femoral head along with a greater stability. We summarized the advantages and demerits of triple osteotomy in Table 4. After this paragraph, we in detail discussed these concerns point by point. Table 4 The advantages and demerits of triple osteotomy. A number of the previous studies on triple osteotomy have reported good improvement of the radiological indices (Figure 1). Janssen et al reported an increase of the CE angle of 24.4° (10.2°→ 34.6°)  and van Hellemondt et al revealed an increase of 19° in CE angle (9°→ 28°). de Kleuver et al reported a reduction of 12° in Sharp angle (22°→ 10°). Peters et al revealed an increase of 20° in the CE angle (11°→ 31°) and a reduction of 11° in Sharp (50°→ 39°). Dora et al showed an increase of 8.2° in the CE angle (7.8°→ 36°) and a decrease of 15° in the Sharp angle (46°→ 31°). Tönnis et al[15,16] reported an increase of 27.8° in the CE angle (-10°→ 17.8°) and decrease of 18° in acetabular index angle (36.7°→ 18.5°)[15,16]. In our case series, the degree of acetabular correction for CE angle, acetabular index angle, and Sharp angle was +19.8°, -15.4°, and -17.3°, respectively. In addition, Hailer et al reported that the median correction of lateralization in their study was approximately 0 mm. On the other hand, Dungl found 6 mm medialization in their young patients (average age 16.5 years). HLI in our series was 0.02; i.e., no medialization of the femoral head was achieved. Frick et al performed detailed analysis by 3-dimensional computed tomography and reported that the acetabular fragment moved in the directions of adduction, anterior rotation (extension), and external rotation, thus improving femoral head coverage. They also found that the surgical procedure increased external rotation of the acetabulum and an excessive external rotation was noted in 22% of all cases. Exaggerated external rotation of an osteotomized acetabulum increases the risk of non-union by producing gaps at the pubic and ischial osteotomy sites[28,43]. Wenger et al reported that a “figure-of-four” maneuver, often used to improve the mobility of osteotomized acetabulum, should not be employed to avoid excess external rotation of the acetabulum. Tönnis et al reported a case of painful hip due to over-correction. Acetabular retroversion is a cause of hip pain[14,46] and Kim et al reported that retroversion of the acetabulum was likely to cause an early onset of coxarthrosis. Femoroacetabular impingement was first described as an anterior impingement after a Bernese periacetabular osteotomy by Myers et al in 1999. Dora et al also reported retroversion of the acetabulum after the Salter and triple osteotomy procedures, and found that a retroverted acetabulum was present in 27% of their cases, with an average angle of -15°. A retroverted acetabulum was more frequent and pronounced after a triple osteotomy than after a Salter osteotomy, i.e., 60% vs 24%, respectively. Acetabular retroversion may further predispose the patient to osteoarthritis[14,46]. de Kleuver et al reported that decreased coverage of the posterolateral quadrant of the femoral head would sacrifice walking ability and recommended not to overcorrect the acetabular rotation anteriorly only to improve anterior coverage. Vukasinovic et al reported that leg length may well influence patients’ satisfaction. Hailer et al reported that the average gain of limb length was +0.5 cm (0 to 4 cm). Dungl et al reported an average gain of +1.8 cm, and speculated that the limb lengthening was due to a distal shift of the osteotomized acetabulum. In our cases, the average gain of limb length was +1.2 cm. In general, the length of the operated lower limb is increased following a triple osteotomy. Dungl et al reported loss of hip flexion and internal rotation after a triple osteotomy. Hip flexion after the operation isrestricted because of the anterolateral tilt of the acetabulum, and the internal rotation becomes restricted in a similar manner. Faciszewski et al studied 56 hips in their series, with an average age of 28 years and follow-up period of 7 years. They reported that patients had a slight decrease in hip internal rotation and abduction. A slight loss of ROM seems to be common in adults after a pelvic osteotomy because of lateral and external correction of the acetabulum. On the other hand, several authors have reported improvement in ROM. In a series of adult patients with mean age of 27.8 years, Kooijman et al found that a moderately restricted preoperative ROM improved to full ROM with 47/51 (92%) hips becoming pain free at 2 years after the operation. In adolescents with an average age of 13.9 years, Kumar et al reported that post-operative ROM in term of flexion and abduction recovered to the pre-operative ROM level with an average follow-up period of 6 years. Steel described the detailed postoperative treatment of a series of patients aged 7-17 years. A cast was maintained for a period of 8-10 wk, after which the K-wires were removed. Passive and active motion was started, and then weight bearing began with crutches at 12-14 wk. Tönnis et al[15,16] reported that patients were immobilized in a long-leg spica cast for 6 wk and weight bearing was not allowed until sufficient consolidation of the osteotomy sites in the first series. The average age in their study was 19.8 years and 12-16 wk were needed before weight bearing began in adults. Weight bearing tended to be later, especially among those with osteoporosis or osteoarthritis. Peters et al noted that patients (average age 26 years) were limited to toe touching for 8 wk, at which time partial weight bearing was allowed if AP radiographs showed adequate osseous healing. Hip ROM and muscle exercises were also begun at 8 wk and full weight bearing was achieved after 36 mo. Hailer et al reported that K-wires were routinely removed approximately 1 year after the operation, in patients whose average age was 23 years. Early mobilization on crutches without weight bearing was conducted for 6 wk and prophylaxis for deep venous thrombosis was performed until full weight bearing was achieved. Janssen et al reported that weight bearing was not allowed for 12 wk in their patients (average 38.6 years). During the early postoperative rehabilitation, ROM exercises over the following limits was prohibited: (1) joint movement only up to 30° for abduction and adduction; (2) no external rotation; and (3) maximum flexion of 60°. When radiographic evidence of consolidation appeared 6 wk after surgery, flexion up to 90° and abduction were permitted. Thrombosis prophylaxis with low-molecular weight heparin was administered for the entire period of limited weight bearing. Vukasinovic et al reported a young series (mean age 15.9 years), in which none of the patients were immobilized and post-operative skin traction was used in all for a mean period of 44.4 d. Rehabilitation began 8.8 d after surgery and weight bearing after 128.7 d. Eren et al described post-operative rehabilitation results after incomplete triple pelvic osteotomy procedures in patients with an average age of 21.4 years. They reported that partial weight bearing (10 kg) with crutches and active motion of the hip were started on post-operative day 3, and full weight bearing with crutches was allowed approximately 6-8 wk after surgery. In Steel’s original publication in 1973, the failure rate was 23% for 52 hips in 45 patients who were followed up from 2-10 years of age. Furthermore, in 1977, Steel reported the results of 175 hips in patients aged 6-35 years (70% aged 9-12 years) after a follow-up period of 3-13 years, which had an 86% success rate. de Kleuver et al and van Hellemondt et al reported the long-term results (mean follow-up of 15 years) of the triple osteotomy procedure in patients (mean age of 28 years) with pre-operative osteoarthritis stage grade 0 or 1. They performed triple osteotomy procedureson 51 patients (5 males, 38 females), 88% of did not undergo total hip arthroplasty (THA) and 83% reported no pain. Furthermore, there was no progression of osteoarthritis in 65% of the patients, and 64% had either “excellent” or “good” clinical scores. They concluded thata significant negative factor for good long-term results was the presence of advanced osteoarthritis designated by a fair or poor pre-operative clinical score. Peters et al found a significant relationship between osteotomy failure and pre-operative osteoarthritis. In their study (mean age: 26 years; mean follow-up duration: 9 years), 27% of the hips were classified as failures, out of which 20% needed to be converted to THA and 7% required THA. They concluded that a triple osteotomy is an alternative modality to THA, although the duration of the operation and postoperative treatment are much longer than that of THA. Dungl et al (mean age at operation 16.5 years, mean duration of follow-up 12.5 years) reported that the results of the osteotomy procedure were excellent in the majority of cases (76% of the cases). In 8 patients (5%) with unsatisfactory results after the operation, THA was performed, whereas another 8 patients (5%) were candidates for THA. Vukasinovic et al reported the occurrence of early osteoarthritis in 4 operated hips (5.3%), of which only 1 (1.3%) required an additional THA procedure 4.2 years later. von Bremen-Kühne et al reported a conversion rate to THA of 2.6%, whereas van Hellemondt et al had a conversion rate to THA of 11.7% after a mean follow-up period of 15 years. In general, long-term results of a triple osteotomy without osteoarthritis or with low-grade osteoarthritis are good. Janssen et al reported that a preoperative body mass index > 25 kg/m2 and HHS < 70 resulted in a poor outcome or early conversion to a THA. They presented results of a triple osteotomy for only second-grade osteoarthritis (advanced stage) related to DDH (mean age at operation 38.6 years), with a long-term follow-up duration of 11.5 years. They concluded DDH even at an advanced stage can be treated with a triple osteotomy procedure. Peters et al found that 98% of their patients would recommend the same procedure to other patients with similar symptoms. In contrast, Hailer et al reported that 65% were satisfied with the procedure, whereas 35% were not, and 2 patients underwent THA after 11 years. The incidence of complications such as non-union at the osteotomy site influenced patient satisfaction. Their analysis showed that the “not satisfied” group was significantly older (P = 0.005) with significantly poorer clinical scores (P < 0.0005). The incidence of non-union (P = 0.0017) and that of other complications (P < 0.0005) was also significantly higher in the same group. They concluded that the occurrence of complications had a grave impact on patient satisfaction. Steel reported no incidence of non-union in their original article, whereas Tönnis reported that 1 patient developed pseudoarthrosis in the pubic ramus (3%, 1/32) and Vukasinovic et al noted that 9.2% (7/76) experienced non-union. In the latter study, there was 1 (1.3%) case with triple non-unions of the ilium, pubis, and ischium, and 6 (7.9%) with double non-unions of pubis and ischium. However, all non-unions were asymptomatic and did not require an additional procedure. They also reported that non-union occurred more frequently when a saw was used (4/12) compared with when a chisel was used (2/64) (P = 0.003), suggesting that non-union may occur because of soft tissue interposition secondary to extensive bone resections. There was no statistically significant difference either between cases with 2 and 3 K-wire fixation, or among the levels of the osteotomy. On the other hand, non-unions tended to occur significantly more often in older patients; the average age in the non-union group was 20.2 ± 27.12 years, whereas that in the union group was 15.5 ± 4.67 years old (P = 0.029). Kirschner et al presented 7 cases of pubis and ischium non-union in a series of 48 patients (14.6%). In turn, Dungl et al reported non-union in 19 of 329 patients (5.4%), of whom 2 patients were triple non-union cases and 2 patients double non-union cases. All triple non-union cases required osteosynthesis and bone grafting, whereas the double non-union cases also needed surgical intervention. Isolated non-union was seen in 15 patients (ischium 8, pubis 7). The most frequent site was the ischium, but isolated non-union was not considered to be indicative for re-operation. van Hellemondt et al reported isolated non-union of the ischium in 3 patients out of 48 (6.25%) as well as an isolated non-union of the pubis in 1 patient out of 48 (2%). Their mean age at operation was 28 years. Their pre-operative grades for osteoarthritis were 0 and 1, and the non-union cases occurred in those with major acetabular correction. Peters et al reported double non-union of the ilium in 2 patients out of 60 (3.3%), with a mean age at operation was 26 years and mean duration of follow-up was 9 years. In 2003, Tschauner et al reported cases of “painful non-union” after a triple osteotomy, and the mean age at operation of the patients was 25.7 years where as the mean duration of follow-up was 7.1 years. Their triple osteotomy utilized the Tönnis method with AO screw fixation. Partial weight bearing was permitted after 8 wk and full weight bearing after 16 wk. Isolated pseudoarthrosis of the pubis was seen in 8 patients (2%), though all were asymptomatic and no further surgical treatment was required. Five patients (1.2%) developed double pseudoarthrosis with non-union of the pubis and ischium, all of whom were symptomatic and required another operation including bone grafting, fixation, and excision at a mean duration of 19.4 mo after osteotomy. 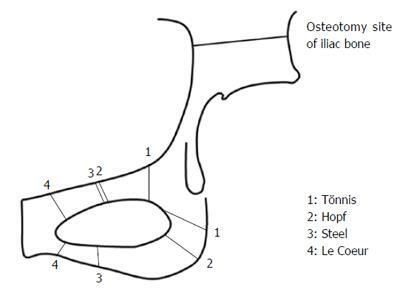 On the basis of their investigation of 409 triple osteotomies, they provided the following recommendation: (1) adequate bony contact should be ensured at all 3 osteotomy sites; (2) 2 or 3 screws should be used for the iliac osteotomy; (3) a long mediolateral screw should be used to stabilize the pubic osteotomy until union; (4) patients should not sit on the ipsilateral ischial tuberosity for 6 wk; and (5) patients should be informed that smoking is a risk factor for non-union. In general, the non-union rate seems to be approximately 7%. Tönnis reported no acetabular osteonecrosis in the first series, and van Hellemondt et al later confirmed the absence of osteonecrosis. Few articles have provided details of acetabular osteonecrosis and, to the best of our knowledge, there are no reports of that complication in association with a triple osteotomy. Steel reported 1 case of infection (2.2%) in their initial article, whereas Tönnis et al and Dungl et al reported none. Furthermore, Van Hellemondt reported superficial infections in 2 (4.2%) and deep infections in 1 (2.1%) out of 48 cases. The prevalence of infection reported by Vukasinovic et al, Peters et al, and Hailer et al was 1.3% (1/76), 3.3% (2/61), and 3.3% (2/61), respectively. In general, the rate of infection seems to be approximately 2.7%. Tönnis et al reported that 1 patient in their series developed transient peroneal nerve palsy, whereas Vukasinovic et al reported 2 peroneal nerve palsy cases (2/76 patients, 2.6%). Dungl et al reported no serious neurovascular complications in their 329 patients. However, in 9% of those cases, loss of sensation in the region supplied by LFCN became permanent. Peters et al also reported temporary irritation of LFCN in 6 of 32 cases (19%), and van Hellemondt et al noted LFCN dysfunction in 9 (19%) and transient palsy of the sciatic nerve in 1 (2%) of 48 cases. In addition, Hailer et al reported temporary sciatic nerve palsy in 2 of 61 patients (3.3%). In general, the nerve injury rate seems to be approximately 9.5%. Some authors found that a dorsal approach to the ischium has a higher level of safety as compared with an anterior approach[15,56,57]. Few studies have investigated vascular injury in detail. Dungl et al reported no neurovascular complications in their 329 patients, whereas Hailer et al reported excessive bleeding from a branch of the internal iliac artery leading to discontinuation of a triple osteotomy in 1 case. In their initial article, Steel reported that paralytic ileus occurred in 2 of 45 patients (4.4%) as an immediate postoperative complication, whereas skin necrosis appeared in 2 patients (4.4%). Janssen et al reported 1case of external snapping hip syndrome in their 32 patients (3%). Hailer et al noted 1 patient with a large hematoma (1.6%), 2 with heterotopic ossification (3.3%), 1 with complete insufficiency of the gluteal muscles (1.6%), and 1 with osteonecrosis of the femoral head (1.6%), though no other details were reported. It is also important to discuss the procedure in relation to childbirth. Winklemann in 1984 observed narrowing of the birth canal after a triple osteotomy performed according to the method of Steel and Tönnis in the middle part of the pelvic cavity. That study recommended a caesarian section in all cases after a triple osteotomy. In those cases, 95 (32%) became pregnant and 40% of those gave birth naturally, with 60% undergoing a Caesarian section. Lorder et al reported that Salter, Sutherland, and Steel osteotomies all narrowed both the inlet and outlet of the pelvis. Female patients should be informed of these alterations and the possibility of a caesarian section for future pregnancies. We summarized the advantages and demerits of triple osteotomy in Table 4. A biomechanical analysis performed by Hsin et al revealed significantly smaller stress on the hip after a triple osteotomy and at the time of the latest follow-up examination than that estimated after surgery. The decrease in stress was a direct result of a significant increase in the area of the weight-bearing surface of the hip. On the other hand, Huang et al reported that patients who underwent an RAO were characterized by a better acetabular index angle than patients who underwent a triple osteotomy. However, the functional outcome based on HHS was better after a triple osteotomy than after an RAO, and patients who had a triple osteotomy tended to express better subjective scores. Aminian et al reported the freedom of the acetabular fragment on flexion (anterior femoral head coverage), abduction (lateral femoral coverage), and external rotation (acetabular retroversion) in several osteotomies using fresh-frozen male cadavers. Freedom of the acetabular fragment was evaluated with a Ganz osteotomy, Tönnis triple osteotomy, and Carlioz et al triple osteotomy in the same article. The results revealed that maximum motion was achieved with the Ganz osteotomy, while “coupled motion” (external rotation during abduction) was most prominent with the Carlioz technique, and no coupled motion was seen with a Tönnis osteotomy. They considered the Tönnis osteotomy to be the safest and optimal for moving the acetabular fragment to improve abduction and flexion, such as the 20-20 rule. In the present study, we present a detailed review of the relevant literature. We found that the clinical results of a triple osteotomy were satisfactory and it should be considered as an alternative candidate procedure for a pelvic osteotomy in older adults with DDH.